commonly found in the southern part of the south shore. 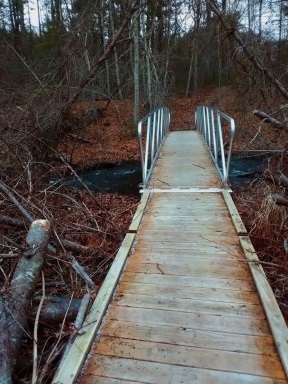 These hiking trails run mostly around older unused Cranberry bogs, and over many culverts crossing the Pine and Howard Brooks and connect to both the Pine Brook Reservoir and the Howard Brook Reservoir. These features give the property it's apt name and make for some very scenic hiking! While there are many locations to access the Cranberry Watershed Preserve, parking is best at the Silver Lake Regional High School. Take the second more southern entrance to the school. This entrance includes the middle school. Heading straight at this entrance passing the middle school and leading to the ball fields is the closest parking. Once arriving at the parking there will be a path visible to enter the forest. There will additionally be a gravel road leading along the side of one of the fields with several other entry locations along this road. If you take the path right out of the parking area, head straight for the preserve. 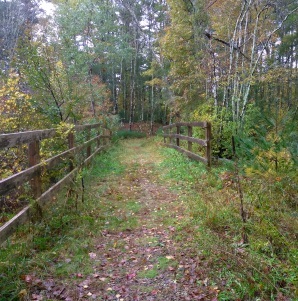 There is a path to the left, while this is interesting it doesn't lead into the Cranberry Watershed Preserve. 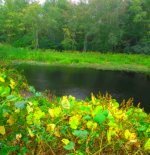 One of the many cranberry bogs the hiking trails here circle or pass by. Great for bird watching! For this page it was decided not to write a guide. Some places just need to be explored! 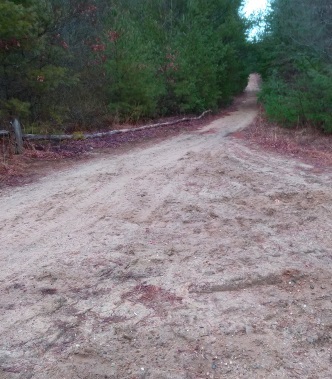 There is almost a dizzying amount of trails interconnecting with a main road around the preserve. There is a map offered by the town that you will find in the trail quick facts to the right, but as with many areas there are more trails than what you will find on the map. but are for Silver Lake's XC track team training. As you may find with a visit after school hours. Following this route will take you deeper into the middle of the preserve. 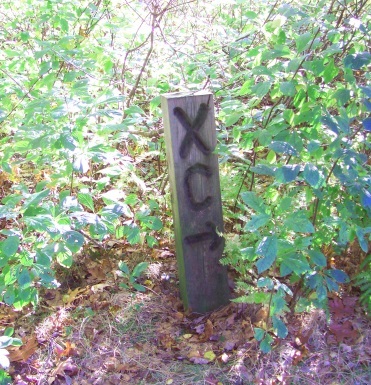 Wide sandy trails are what circle the main route through the Cranberry Watershed Preserve. around on the same wide road. This route will take you past both reservoirs. Using the map with either route is highly recommended! There are many paths leading to the left of this wide sandy road. Many will eventually lead to private property or out to streets in the area, lower portions of Pembroke St (route 27), Reed St, Grove St and Lake St. Some are long and interesting. 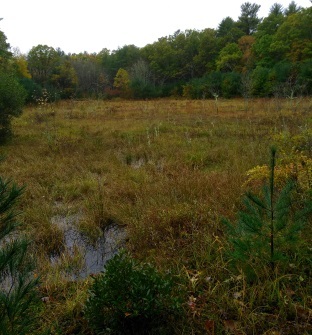 Many of the trails along cranberry bogs are grass filled. adding to the serene atmosphere. 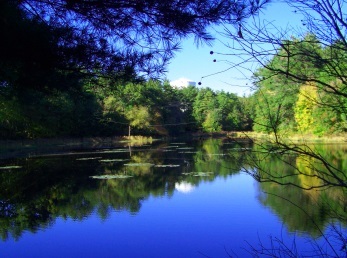 A picturesque Howard Brook Reservoir, beautiful in any season! If you do park at the high school to access the Cranberry Watershed Preserve, this is the first scenic attraction you will come upon. 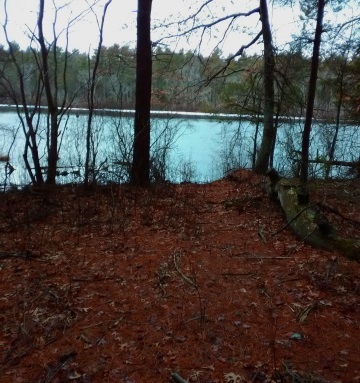 The trail runs alongside one of the ends of the reservoir. There is a small "beach" along this side. Thinking this would make a good dog beach in the warmer months! 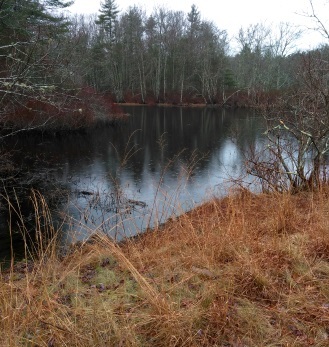 Even in winter the Pine Brook Reservoir is a welcome sight! This body of water sits off to the side a bit in its own area. If you follow the XC blazes, they sent you into other areas of the preserve away from this reservoir. trail entering the forest, you will find another bog the trails circle around. 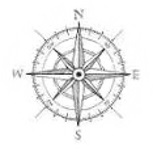 There are many side trails in both directions. When you arrive at the intersection before circling around the bog, there is a narrow traditional hiking trail up a moderate ascent into the forest. This trail is not readily observable. It is to the far left at an intersection with two wide road like trails. 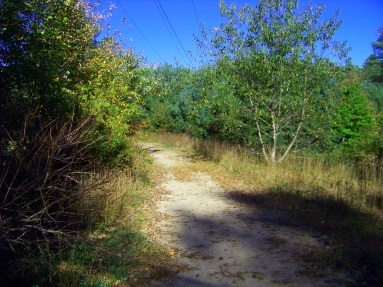 This trail takes you along the far edges of the Pine Brook Reservoir. The map makes it appear that the trail stops here. However the trails continue on private land that it appears the owner doesn't mind others using. In fact it is well cared for! You will eventually come upon no trespassing signs and cart paths that are less well maintained. There is a story here! 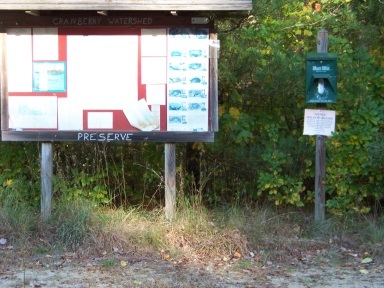 Hiking through the preserve you will most likely come upon the kiosk pictured above. Across from it is a parking area with a rustic split rail fence partially lining the area. One look and you will know that this parking area has been unused for quite some time. There is an access road beyond that leads out to Grove St.
Across from this access road on Grove St. is a town sign pointing to the access road bringing your attention to the existence of the preserve. Do Not Make The Mistake of Parking Here!! There is a chain in front blocking the access. The town planned this parking but according to a page on Bay Circuit Trail's website the town doesn't own the land. Controversy has ensued with the land owner. I found this out the hard way one morning after a hike. Got a nasty note on my return. There should be a no parking/pedestrian access only sign here. It would be a kindness and remedy to the situation. The parking at the school is a better security alternative. Not far from the unused parking area the hiking trail turns grassy as it does many times throughout this preserve. At the same time it crosses one of the brooks that run across the property. Most likely this is a culvert buried below the trail. The addition of the fencing is a nice rustic touch lending to the bridge like appearance. A personal favorite feature of this preserve. 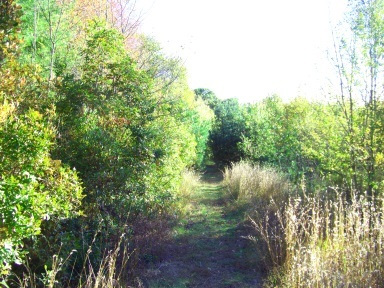 In the northeast corner of the Cranberry Watershed Preserve, a trail runs along the lower portion of the ball fields. The Bay Circuit Trail runs along here as well. As the Bay Circuit exits the property it does so by a long boardwalk with a bridge over the Jones River. The Bay Circuit takes a right onto Lake St and continues onward toward the Silver Lake Sanctuary. Heading south on route 3 take exit 9 heading north on route 3A. Straight through the intersection with route 80. Left at a fork continuing on rt 3A then left at the fork continuing on Main St now route 106. Veer right onto route 27. From this intersection you will travel approx. 2 1/2 miles to the entrance of the Silver Lake Regional High School/ Middle School. Head straight at this entrance past the middle school and to the ball field parking. Parking lot beyond the middle school 20 or more spaces. Pull off further down on Lake St at the Jones River/Bay Circuit Trail Kiosk.